Christian Laycock joined Moore Ingram Johnson & Steele in 2013 as a member of the firm’s Litigation Department. 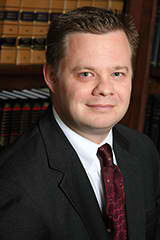 He focuses his practice on general casualty, premises liability, civil tort litigation, and general trial practice. Chris has been working in the field of insurance defense since 2012. Chris graduated from Colby College in Waterville, ME, with a B.A. in Government. He received his Juris Doctor degree from the Georgia State University College of Law where he was an Atlanta Law School Fellow. Prior to working in civil litigation, Chris served as a prosecutor in the Fulton County District Attorney’s Office where he represented the State of Georgia in criminal proceedings. Chris was admitted to the Georgia Bar in 2009. Before becoming a lawyer, Chris was a police officer with the City of Marietta for 12 years. While at the City of Marietta he served as a supervisor, homicide investigator, hostage/crisis negotiator team leader, and a police instructor in interviews and interrogations and death investigations. Chris and his wife, Kelly, live in Marietta with their three children. He enjoys reading, movies, the Atlanta Falcons, and shooting sports.